And God said, "Let there be light," and there was light. And, once again, I was in the wrong place at the right time. 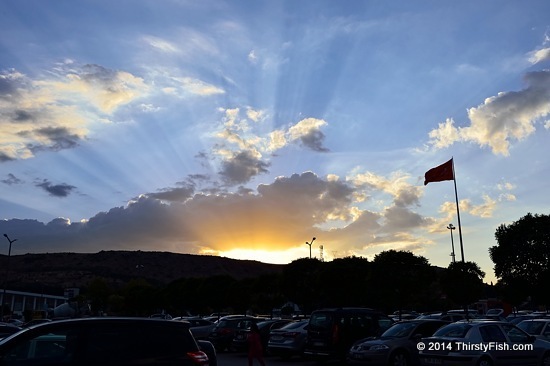 I was in a parking lot in Afyon on my drive to Ankara. Afyonkarahisar gets its name from opium (afyon), which was once widely grown there. Today, it is a hub renown for its cuisine and has a number of well-established roadside restaurants for travelers. Crepuscular rays, better known as "God rays", "fingers of God", or "Jacob's Ladder", are rays of sunlight that appear to radiate from the point in the sky where the sun is located. The fanning out of crepuscular rays is an illusion, caused by perspective - these rays are actually parallel. There is no sure way to predict when these rays might occur, but look for patchy clouds around dusk or dawn. Many great landscape photographers repeatedly go to the same locations and wait for the light until the "let there be light" moment.